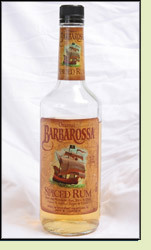 Andy: Barbarossa Spiced rum has a very sweet aroma and taste, but really doesn’t have any other flavor. It kind of tastes like a light rum mixed with corn syrup. It has the same alcohol content as Captain Morgan with a much more noticible burn. It isn’t horrible mixed with Diet Coke, but it definitely lost all hints of flavor. Eh, at least it’s cheap. Adrian: This was way sweeter and had more of a burn than Captain Morgan or Trader Vic’s Spiced, but had less flavor too. When combining with Diet Coke, it just waters down the soda and completely looses what little flavor it had. Have you ever maked Rum cookies with it? I understand you guy’s are all about the drinkablity of the product but in baking Barbarossa has a high vanilla flaver that inhances the baked goods. The typos are noticible, and after reading the reviewer looses all credibility. If you like Captain, but are on a budget, pick this one up.